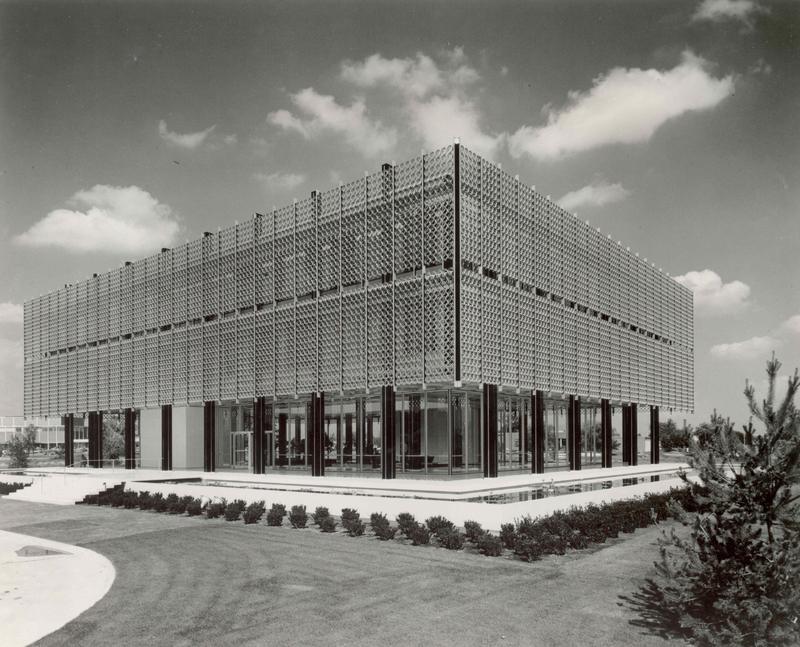 Located on the corner of Northland Drive and Northwestern Highway, this three-story building with open design and central atrium, was hailed as an “ode to aluminum”. Atop the atrium a skylight made of a series of pyramids floods the structure’s central core, while the glass walls of the upper floors are sheathed in light deflecting aluminum grills. Years later the Reynolds Building was converted to a health club and is currently for sale by LA Fitness. The building will be open for the Southfield Mid-Century Modern tour. Also open on the tour, which includes 26 buildings and three neighborhoods, are the Shaarey Zedek Synagogue and Northland Theater. Shaarey Zedek was designed by famed New York architect Percival Goodman with Albert Kahn & Associates. The synagogue, dedicated in 1962, is considered a masterpiece of modern design. The Northland Theater, built in 1966, is a classic of its era and one of the last theaters in Michigan to be built to seat 1,500 people in a single auditorium. The bus tour, sponsored by the Southfield Historical Society, the City of Southfield Planning Department and DoCoMoMo, will begin at 2pm on Sunday, Oct. 6th at Shaarey Zedek (27375 Bell Road at 11 Mile Road). Free parking is available at the site. The tour will also include the Northland area, a loop through Northland Gardens, Washington Heights and Cranbrook neighborhoods, as well as the Northwestern Highway corridor. Duration of the tour is approximately two hours and 30 minutes. Mid-Twentieth Century architecture and design (referred to as Mid-Century Modern) in recent years has seen a tremendous resurgence. Producers of TV shows, fashion and interior designers, museum curators, writers and others are re-examining this period resulting in renewed popularity of post World War II design. During the 1960s Southfield was Michigan’s fastest growing city. Because of that Southfield has a large, amazing collection of Mid-Century Modern homes, commercial and office buildings and religious institutions. DoCoMoMo (Documentation & Conservation of Buildings, Sites & Neighborhoods of the Modern Movement), headquartered in New York City, invited Southfield to join its 7th annual tour program. The Southfield architecture tour is one of more than 50 tours planned for the weekend of Oct. 5th & 6th in 23 states and 40 cities across the US. Of the more than 50 national events scheduled that weekend, four will be held in Southeastern Michigan. Michigan Modern: Design the Shaped America & Forging Cranbrook’s Gatescape Exhibition – Saturday, Oct. 5 – 1-3pm – Sponsored by Cranbrook Center for Collections & Research & the Cranbrook Art Museum. The purpose of this tour is to create awareness and appreciation for some of Southfield’s distinctive buildings and homes and to promote Southfield as a place to live and do business. Guides will comment on the distinctive features of Mid-Century Modern architecture as well as architects of the day. 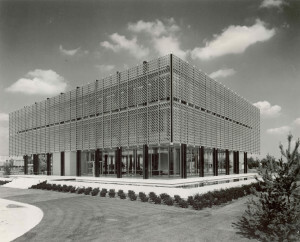 Southfield has buildings designed by noted architects Victor Gruen, Yamasaki, Gunnar Birkerts, Rosetti & Associates, Louis Redstone, among others. Tickets for the tour are $20 and are available in the lobby of the Southfield City Hall (26000 Evergreen Road, Southfield 48076) or through tour facilitator, Southfield historian and City Council President Ken Siver. For additional information, please contact Ken Siver at ksiver@cityofsouthfield.com or (248) 569-4286 or Southfield City Planner Terry Croad at tcroad@cityofsouthfield.com or (248) 796-4154.